Many investors avoid currency risk when buying debt issued by borrowers in foreign countries, but the U.S. dollar's international status makes dollar-denominated debt an easier sell. Almost all owners of foreign bonds hold that debt in their own currencies, rather than in the currency of the nation where the debt was issued. This home currency bias is so strong that, if one knows the currency in which a bond is issued, it is possible to make a very good guess about the nationality of its owner without knowing the nationality of the debt issuer, according to findings in International Currencies and Capital Allocation (NBER Working Paper No. 24673). The only country for which this pattern does not hold is the United States, because the dollar is an international currency. Foreign debtholders are willing to hold U.S. debt issued in U.S. dollars, and this pattern has grown stronger in the last decade. This willingness of foreign investors to hold dollar-denominated bonds means that many U.S. companies can tap foreign markets to borrow more easily than firms in many other countries. Market Anticipation of FOMC Policy "Shocks"
Who Gains When a City Has a Productivity Spurt? The study, by Matteo Maggiori, Brent Neiman, and Jesse Schreger, draws on Morningstar data on $27 trillion in holdings in mutual funds in 50 countries. It finds that "home country bias," the tendency to hold assets denominated in the home currency of the investor, holds whether the debt issuer and buyer are from the same country or not. The bias is not surprising when they share the same nationality. The case of Canada is illustrative. When Canadians are buying Canadian corporate or sovereign debt, 95 percent of those holdings are in Canadian dollars. But when foreigners buy Canadian debt, less than 20 percent of it is denominated in Canadian dollars. Instead, it is usually denominated in the foreign investors' own currencies. The home currency bias is especially pronounced in corporate bonds. 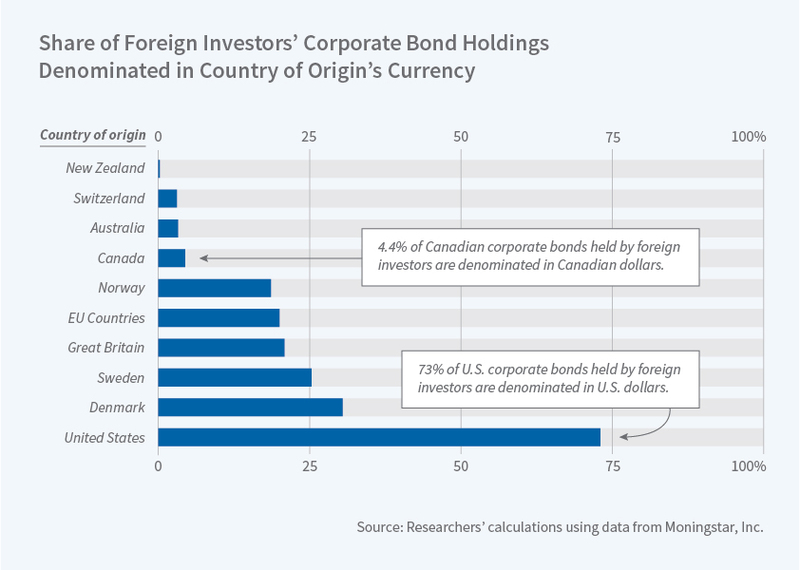 Less than 10 percent of Canadian corporate debt held by foreigners is denominated in Canadian dollars. Small- and medium-sized businesses prefer to borrow in local currency, so most of their debt is held domestically. While foreign investors hold shares of many of these firms, they rarely hold their debt. The U.S. is the lone exception to the patterns identified by the researchers. Foreign investors do hold the debt of U.S. companies in dollars as well as in their own currencies. This exceptionalism appears to have strengthened during the last decade. A decade ago, only about 45 percent of global cross-border holdings of corporate debt was denominated in U.S. dollars, while the euro accounted for 35 percent. Now, the dollar share is greater than 60 percent and the euro share less than 20 percent. "Global portfolios shifted sharply away from the euro and toward the dollar after the 2008 financial crisis, further cementing the dollar's international role and potentially amplifying the benefit its status brings to the U.S.," the researchers report.